So here’s the real dirt on artificial turf in San Diego. Not all turf is created equal! Many claim to be made in the USA, but few are. Many import the materials from overseas and assemble it here under false pretenses. One brand Professional’s Choice Synthetic Turf, from Village Nurseries is made in the USA. It is lead free too, unlike some of the other imposter varieties out on the market. This product line is generated from products from Dupont and Exxon, a few major USA Corporations of note. Please note, Village is to the trade only, so have your contractor procure the materials from them. This turf employs “super soft technology”, a de-lustering agent (so it doesn’t shine like a Christmas Tree). It has to be installed correctly as it does have some sheen in one direction versus the other. This turf is do adaptable that it is guaranteed not to shrink in the heat or cold. And mentioning heat, we all know that most artificial turfs do heat up in direct sun…this product uses “Cool Technology” and the 80 ounce version is at least 20% cooler than other turfs. This is the whole idea of using turf as homeowners want to be able to enjoy being on it with their families. No burned bare footed children on this playing field. In fact there really aren’t various grades of artificial turf (really an outdoor carpet if you will). It is the amount of blades making up the various choices. This product line has Platinum at 80 ounces, Gold at 60 ounces and Silver at 40 ounces. There is also a grade of Pet Turf. This simulates a freshly mowed lawn only 1 1/8 inches thick. Other standard turfs are installed at 1 ¾” deep. The pet turf can be cleaned with Simple Green. The key is the type of underlayment and in fills. The in fills, is the additional elements added to the turf to keep the blades of turf standing up. Certain types such as silica sand or crumb rubber will absorb odors….not what you want with pet turf. Professional, certified installers can walk you through those options. 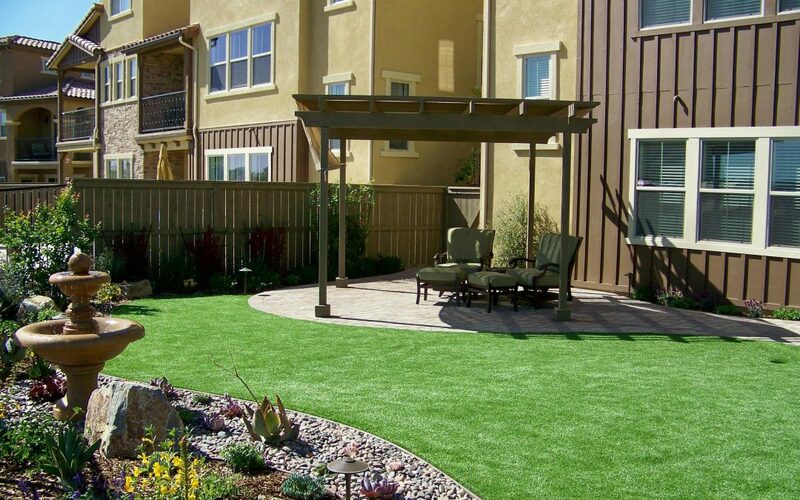 Another reality is that artificial turf is not maintenance free, it is LOW MAINTENANCE. It does require at times additional in fills and to be “fluffed up” with certain equipment. Despite this, there is an 8 year warranty on the product itself and most contractors will offer a two year warranty on the installation. This artificial turf does require so “know how.” It is best to sit on a 2 inch layer of Class II road base and 1 inch of decomposed granite. And it should have a layer of weed barrier beneath it too. It can be laid directly over concrete as well. So, the installation is really the key for long term success of this product. One other benefit of any artificial turf is it’s resistance to gophers. As gophers are typically looking for an earthy smell, moisture and insects to eat, the standard installation of the road base and decomposed granite make the area unattractive to these pesky critters. So in the end, Artificial Turf in San Diego is one product that over time can actually pay for itself. This concept of reducing work and water may be here to stay with or without a drought. I have used artificial turfs on numerous projects in limited applications. The key is the overall design, having living plants next to it will make it seem more realistic. Please don’t install it “wall to wall” or from sidewalk to the foundation. I’ve actually seen that done and it is not appealing. Please contact Letz Design for more information on how to best utilize this low maintenance and water free product.